All great adventures start with a single step. This is the perfect place for you to start yours. Whether you are just starting out, or have gotten frustrated and are looking for help, we'll walk you through the steps to produce your first successful creation and get you on your way to many more. Securing a ball in your chuck with the desired point correctly positioned. Cutting a chase with your #4 cutter. Verifying that the cutter is shaped properly. Sharpening the cutter and keeping it sharp. Sanding a sphere in the chuck. Clearing out dust and chips from your sphere. Loosening the chuck, re-positioning the sphere and re-tightening the chuck. Yeah, there's a lot of stuff to be learned before you even start a multi-level project. It's certainly possible to just read through this and jump straight to a more advanced project. The worst you'll probably do is grow your kindling pile - but you'll probably have fun doing it anyway. 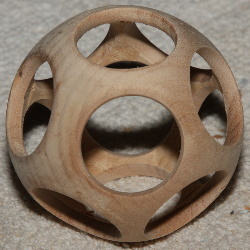 Personally, I still like making single level balls, especially out of particularly handsome woods that don't lend themselves to multi-level balls. Here's a list of items you'll need for this project. Jacobs chuck to hold the forstner bit. The #4 crown cutter or any other hollowing tool that will cut a chase 1" to 1-1/8" radius. Ensure that your cutter is shaped correctly and sharp. See the section on hollowing tools for more info. Forstner bit. 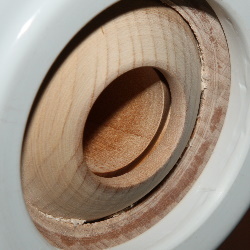 7/8" is a great size, 1" is about the maximum and 3/4" allows for satellite holes and detail around each hole. In the photos below, I'm using a 1" bit. Sandpaper. I suggest 150, 240, 320 and 400. 1 Start with a round ball. A ball that isn't round will exaggerate errors in layout, be difficult to secure well in the chuck and hard to keep the fence of the cutter well positioned. 2 Layout your sphere with the 12 primary points. See the paget on layout for details. 3 Optional: layout the 20 satellite points. I suggest skipping the satellite points when starting out. 4 Select your drill bit size and mount it in your tail stock with a jacobs chuck. 7/8" is a good size to start with, and will allow space for a 1/4" or even 3/8" satellite hole later. 3/4" is a typical size when making a full 5-level ball and leaves plenty of room on the sphere surface for decorative work. I'm using a 1" bit here that produces a slim sphere with little room for anything else. 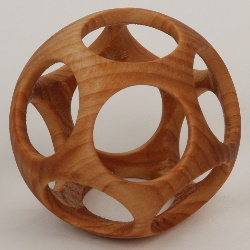 5 Place your sphere in the hemispherical chuck with the #1 end grain point facing out. Place the collar in the cap and and put the cap over the ball. 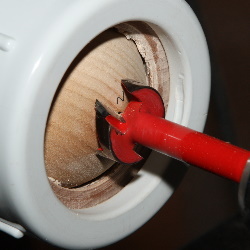 Lock your spindle (if using a screw-on chuck face) and tighten the chuck loosely so that the ball can still move around. Bring up the tail stock carefully so as not the jab the ball and lock it in place. Rotate the ball so that the center of the forstner bit touches the marked point on the ball. 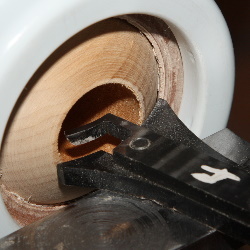 Advance the tail stock so that the ball is pushed firmly against the back of the hemispherical chuck. 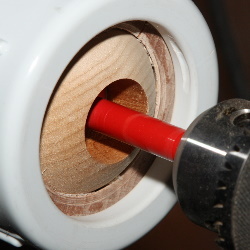 Tighten the chuck while ensuring that the ball point remains centered on the bit. 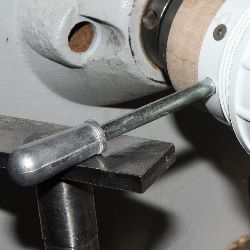 6 Unlock your spindle, back the bit off the ball and turn on your lathe to a comfortable speed. I use about 500 rpm, but you may go as low as 250 or as high as 750. Drill into the ball slowly, just past its center point, about 1-1/2". You may want to retract the bit and clear out shavings once or twice. I use forced air from a compressor, but you can blow with a straw as well (in either case, protect your eyes and lungs from the dust). Turn off your lathe. 7 Bring the flat tool rest up to the tail stock and adjust the height of the rest so that the top of a cutter, set flat on the rest is exactly at the center of the bit. 8 Bring the tool rest up to the ball so that it's about 1/4" away from touching the ball or the chuck. Rotate the chuck to ensure that nothing is touching and that the spindle is unlocked. Turn on the lathe. 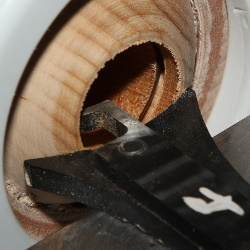 Lay the #4 cutter flat on the tool rest and position it so that the cutter can slide into the opening safely without touching the wood. Insert the cutter into the hole until the cutter's fence is against the spinning ball. It's possible that you may do some cutting as you fully insert the cutter. Ensure that you firmly hold the cutter flat on the tool rest and proceed very slowly. 9 While continuing to hold the tool flat against the tool rest and the cutter's fence against the ball, very slowly slide the cutter to the left. The cutting should be smooth and easy. There should be no binding, extreme friction or catching. Continue slowly until you reach the full depth of the cutter and then remove the cutter by gliding it back to the right in the same way. You may want to cut a bit, remove the cutter and clear the chips and then cut some more, especially with the #4 cutter. Check the temperature of the cutting tip and quench in water before it overheats. 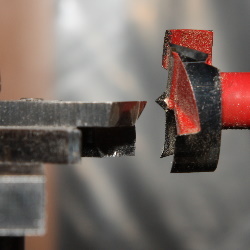 If the cutter tip is allowed to change color, it may loose its temper. 10 Turn off the lathe and check your work. 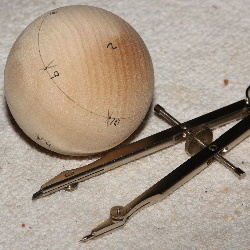 Most problems here are related to ball roundness (can't hold the cutter's fence against the ball) or improper cutter shape (binding, catching or excessive heat). Fix these issues before proceeding. 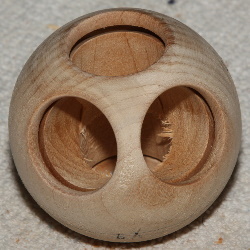 11 Turn the lathe back on and sand the face of the ball. This is the last opportunity you'll have to do this easily. If you choose to smooth the inside of the hole, wrap the sand paper around a small dowl and keep your fingers out from inside the hole. 12 Optional: After you get the hang of making these you may want to try adding a bead around the primary holes. A beading tool is the simplest way of doing it, but any pointed lathe tool with work. 13 Now that primay hole #1 is complete, you need to move the ball to the second end grain hole. To loosen the collar, I bring the tool rest to the side of the chuck, insert a rod into the hole, grasp the cap and unscrew it. 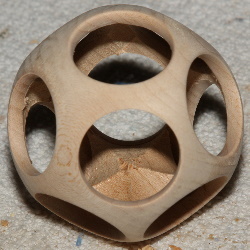 14 Reposition the ball so the next primary point, #2 (the other end grain point) is facing outward. 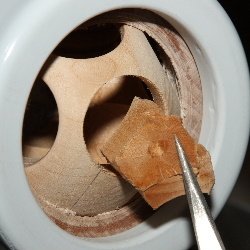 Repeat the steps above to position point #2 with the tail stock and tighten the cap. 16 When you begin working primay point #3, things will start to change. The cutter will move into the chase cut from the adjacent hole. This will create a much different sensation in the feedback at the tool handle. It can also misslead you into increasing the feed rate of the cutter. Just continue cutting very slowly. 17 Cutting the chase at the #4 hole will cause even more 'gap cutting'. Just continue to cut slowly and evenly. As you tighten the chuck at new holes, you'll notice the ball loosing more of its strength. Be careful and try to find a balance between crushing the ball and leaving the chuck too loose. It the chuck is too loose and the ball moves, it's a bad thing. 18 As you finish half the holes, you'll be cutting more into empty space than into wood. Continue to cut slowly and evenly. 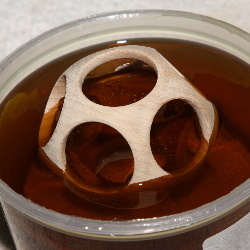 Also, pieces of the interior wood will begin to break out. 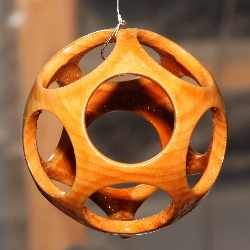 Carefully fish them out with the lathe turned off. Also around half way complete, start checking your cutter to make sure it's still sharp. If not, sharpen it carefully while it's still held in the cutter. As you get used to your cutters, you'll notice more easily when they're no longer sharp. 19 When you have only the 12th hole remaining to be cut, note that there is a large piece of wood that's going to come loose. Cutting the chase at that hole is mostly just clean up more so than much cutting. 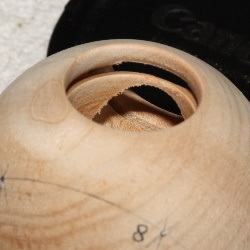 You may need to use a drill or a dremel to break up that final loose piece. 20 You're 1 level ball is now complete. If you've been sanding as you go, not much clean up should be left. You can call it done, or put some finish on it. 21 Optional: If you want to put finish on the ball, you have more options with a single level ball than you do with multi-level balls. 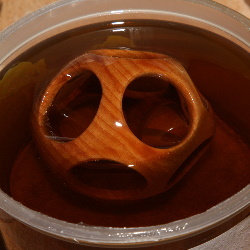 I often use Mahoney's walnut oil becuase it works well with multi-level balls as well. I pour the oil into a covered bowl and just drop the ball into it. 22 I try to let the ball soak in the oil for about 15 minutes or so. Be sure to turn the ball around every few minutes. 23 When the ball's done soaking, I fish it out with a fishing hook on the end of a string. I let it hang for about 10 minutes and then wipe it off as well as possible and rotate the way it's hanging. I repeat this about every 20 minutes for an hour or 2 and then just let it sit to cure.